This simple strategy helps you zero in on where students really need help. Conferring with students can feel overwhelming, but it doesn’t have to be that way. 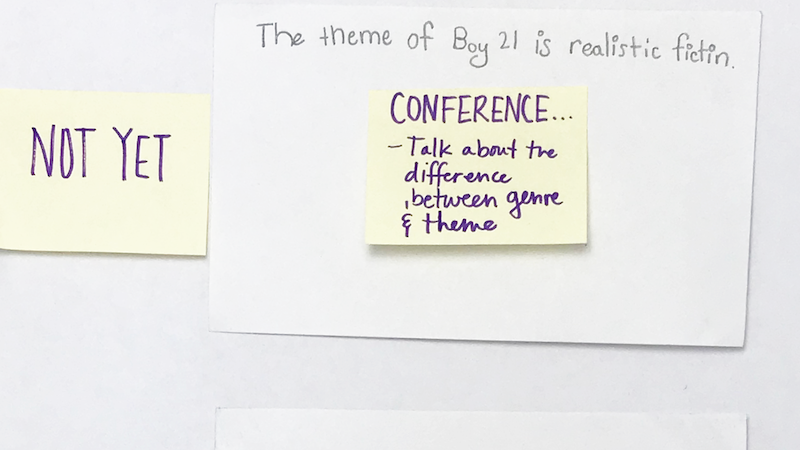 Here’s how I target specific skills for writing conferences with one simple strategy: having students write a small portion of their essay on a note card or in Google Forms. In the image above, students wrote their claims for a thematic essay on a note card. The teacher then organized the students’ claims by placing them into one of three piles: Not Yet, Approaching, and Strong. Students in the Not Yet pile need an urgent conference to clarify misunderstandings. Writers in the Approaching pile need some kind of skill development conference. And students in the Strong pile still need a conference, too, but it isn’t as urgent. You might also notice that certain skills need to be taught to the whole class rather than in individual conferences. For example, all of these students could use a mini lesson about how to format book titles. Instead of using note cards, use a Google Form. After students have filled out the form, you can organize their responses in a spreadsheet and plan your targeted conferences accordingly. In order to view responses, you need to make sure the cells in your spreadsheet are in wrap text, not in overflow mode. The first image below shows overflow mode; the second image shows wrap mode. What skills do I target for these writing conferences? Here are some examples of skills you can target, based on the genre of the writing. Have students describe a character or a setting by using as much sensory language as they can. You will be able to pinpoint exactly who needs extra support by looking at the length and diversity of students’ writing. Have students pick two characters from their narrative and write a conversation. You can easily assess which students use dialogue properly and which need guidance. After students write their narrative, have them write a theme for their story on one side of the page. On the other side, have students write ways they could hint at the theme with dialogue, describing their characters’ thinking, or action. In order for students to write effective informational pieces, they need to know why they are writing, not simply that the teacher told them to. What many students don’t realize is that their informative essay can have multiple purposes. Sometimes when students write informationally, they pick topics that are too broad. Having students write their topic on a note card can help teachers see which students need help narrowing their ideas. When students write informationally they need to reference outside sources. Choose a quote from a source and have students write their thoughts along with the quote. Have students write their best claim idea on a note card, after brainstorming ideas in their notebook. You can immediately find out who has the beginnings of a great essay and who needs extra support. Many students struggle with organizing essays. By having them write what the first sentence of each of their supporting paragraphs will be, you can see who exactly needs help with organization. 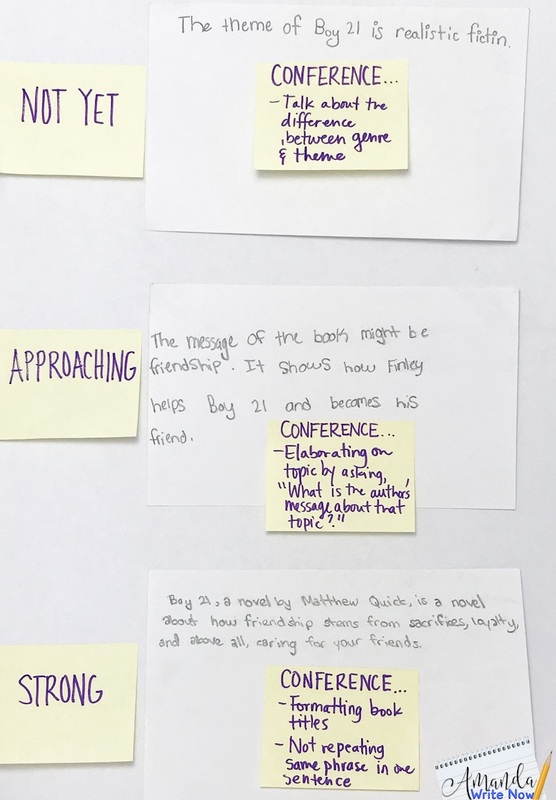 The teacher can easily see which students are able to use quotes, transitions, and compelling reasoning by having them write their evidence and reasoning on a note card. Looking for more support with writing conferences? 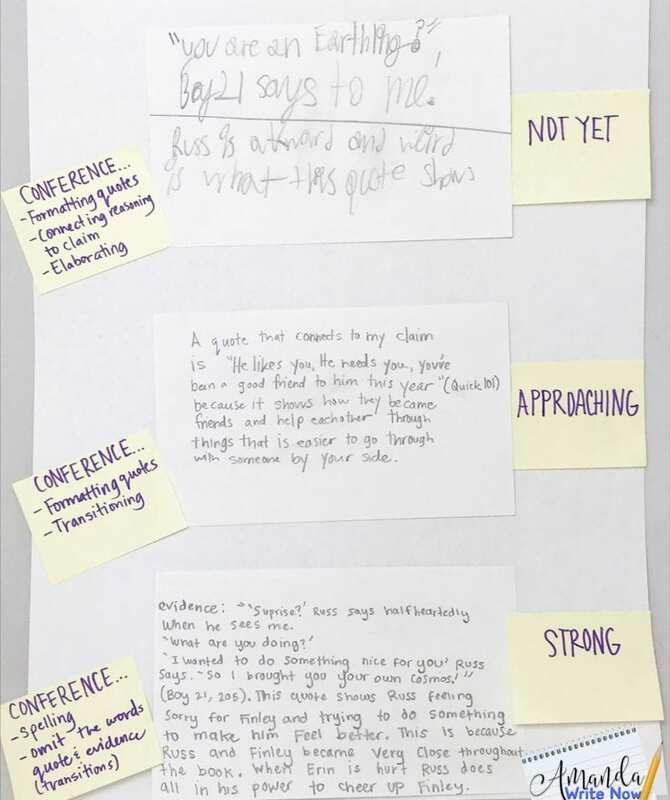 Read A Guide to Meaningful Conferences with Student Writers to learn more about the structure of writing conferences. Watch this video and then show it to your class to encourage conferences between students. 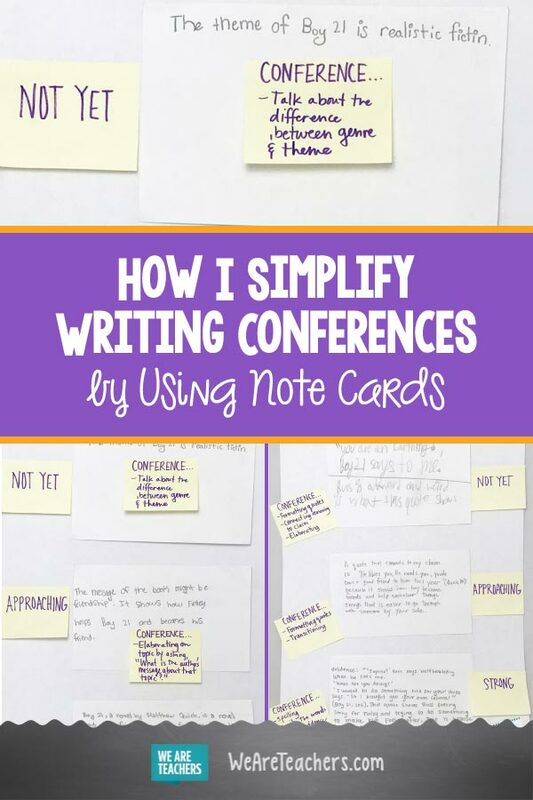 Have you tried using note cards or Google Forms in writing conferences? We’d love to hear about it. Come and share in our WeAreTeachers HELPLINE group on Facebook. Plus, four ways to use conferring notes like a pro.